Great Waitress was formed in 2009, curated as a first time collaboration at the The NOW now Festival in the Blue Mountains, NSW. Since then the trio has released two albums, and performed many events in Australia and across Europe including the NOW now Festival 2011, Sound Out Festival (2011), Konfrontationen (Nickelsdorf Austria, 2011), Music Unlimited 26 (Wels Austria, 2012) and All Ears Festival (Oslo, Norway 2014). Presenting the unsettling sound world of Great Waitress’ Hue. 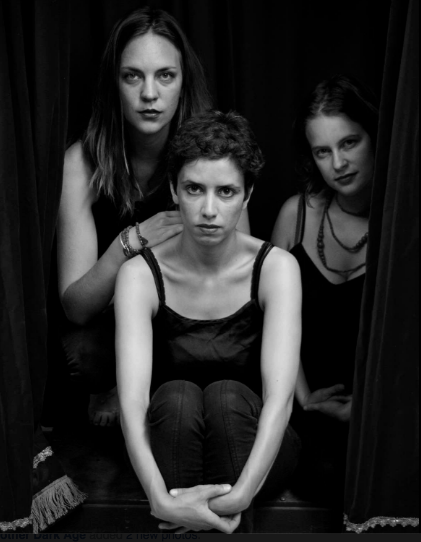 Magda Mayas (piano, DE), Monika Brooks (accordion, AU) and Laura Altman (clarinet, AU) release an echt zeit musik LP from a 2014 ABC studio session in Sydney. This forbiddingly beautiful and jagged real-time orchestration brings together extended technique improvisations to conjure a vast sound imagery that shifts from wide, empty pastures to terrifying Schwarzwald isolation and claustrophobia. First performing in 2009, the trio’s debut album, Lucid (2011), on SplitRec was a dazzling offering on Jim Denley’s institutional imprint. So to was their follow-up, Flock (2013), on Portuguese label, Creative Sources. Hue is a sophisticated distillation of these previous two CD albums and is presented on the vinyl format that Great Waitress has always deserved. On Hue, free improvisations offer flourishing moments of intensity that give way to shy, tender passages. The deep, textural explorations of each instrument confirm the accomplished musicianship of Mayas, Brooks and Altman and at times the record is so minimal it sounds closer to field recordings. This sparse real-time arrangement shows the performative class and collective listening of this trio, honed over seven years of working together. The wide-reaching influences and technique of each member converge on Hue in a way that makes close listening unavoidable. From 2008 Laura Altman and Monika Brooks’ duo excited the Sydney experimental scene, (of which they were important contributors), with quiet, ambiguous, ephemeral music – they treated duration as if it were precious. Spawned from the Splinter Orchestra (splitrec 17), and mutated by current viruses, Altman’s clarinet and Brook’s accordion fused, not with lines, but with pools of sound, coexisting in an ecology that had no clear beginning or end – a calmly focussed, infinite field. As such, it was a seminal Sydney impro project. In January 2009 the Berlin-based pianist Magda Mayas collaborated with them on a memorable performance at Sydney’s Now now Festival. Mayas injected not only an array of startling sounds, but insistent motion to contrast the stasis. Two years later they reconvened as a band for an intense period – a return appearance at the 2011 Now now Festival, gigs around Sydney, the SoundOut Festival Canberra and finally this studio session. Great Waitress initially possessed a dual processor – the long durations and static patience of the duo and Mayas’s compulsion for change. This created a vital rub – there was an edge between these world views. But as they evolved over this period, this duality splintered into multiplicity.